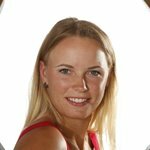 Caroline Wozniacki (born July 11, 1990, Odense) is a Danish tennis player. As of April 30, 2007, she is 120th in the WTA rankings. Being born to Polish parents, she is trilingual, fluent in Polish as well as Danish and English. She has won several junior tournaments (including the 2005 Orange Bowl tennis championship), and made her debut on the Sony Ericsson WTA Tour at Cincinnati's Western & Southern Financial Group Women's Open on July 19, 2005, losing to the top-seeded and later champion Patty Schnyder in the first round. In 2006, she was the first seed at the Australian Open (junior girl's singles), but lost the final to eight-seeded Anastasia Pavlyuchenkova of Russia, with the score 6-1, 2-6, 3-6. She was seeded second with Anna Tatishvili in the doubles-tournament, but the pair was knocked out in the semi-final by the French-Italian pair Alize Cornet and Corinna Dentoni, who was seeded eighth. In February, 2006, in Memphis, she reached her first WTA Tour quarterfinal, beating Kristina Brandi and Ashley Harkleroad in the first two rounds before losing to third-seeded Sofia Arvidsson of Sweden. Later that year she was given a wildcard to the 2006 Wimbledon Championships senior qualifying tournament, where she was beaten in the first qualifying round by Miho Saeki in three sets: 6-3, 2-6, 3-6. However, Wozniacki went on to win the girls' singles tournament, beating Slovakian Magdalena Rybarikova 3-6, 6-1, 6-3 in the final. In August 2006 she reached another WTA Tour quarterfinal, this time at the Nordea Nordic Light Open in Stockholm. She defeated top 100 players Iveta Benesova and Eleni Daniilidou before falling to eventual champion Jie Zheng (seeded 3rd). Wozniacki was seeded #2 in the year's last major tournament, the 2006 U.S. Open - Girls' Singles. In the first round, on September 3, she won the first set against Russian Alexandra Panova, but was disqualified in the second set for verbally abusing an umpire. 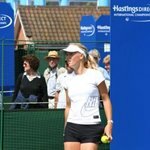 Wozniacki was said to have used an expletive in referring to a linesman who made a disputed call, however, on her blog, she claimed to say "take your sunglasses of [sic]" and to be mistaken for talking to the linesman when she was criticizing herself after the next point. In her last junior tournament, the Osaka Mayor's Cup, she won the girls' singles and doubles. Her first senior title came shortly after on October 29, 2006, when she won the $25,000 ITF-tournament in Istanbul by beating Tatiana Molek 6-2, 6-1 in the final. Wozniacki was set to face Venus Williams on November 27, 2006 in an exhibition match in Copenhagen, but five days prior to the event, Williams canceled because of an injury. The two did, however, face each other in the Memphis WTA Tier III event on February 20, 2007. Williams beat Wozniacki 6-4, 6-4, ending the 9-match winning streak Wozniacki had at the time. On November 30, 2006 Caroline Wozniacki was named ambassador for Danish Junior Tennis by the Danish Minister of Culture, Brian Mikkelsen. On February 4, 2007 she won the singles title in Ortisei, Italy, at an ITF $75,000 tournament, beating the Italian player Alberta Brianti by 4-6 7-5 6-3. On March 4, 2007 she won the $75,000 ITF tournament in Las Vegas, beating top-seed Akiko Morigami 6-3, 6-2 in the final. She obtained a wild card for the 2007 Indian Wells Masters main draw and made her WTA Tier I-debut there. She was knocked out in the 2nd round by Martina Hingis, 6–1, 6–3. The two faced each other again on April 27 in Copenhagen for an exhibition match, where Wozniacki again lost by 6-7 (7-9), 6-3, 2-6.